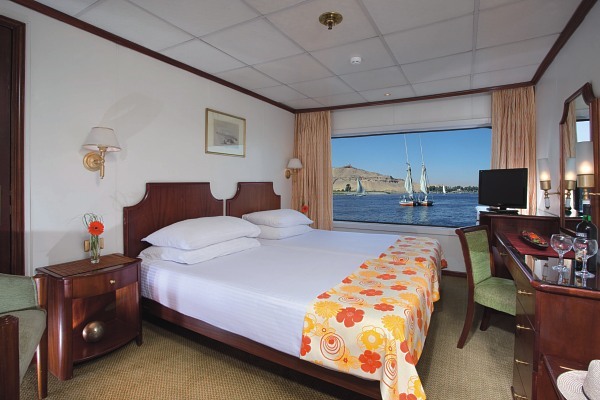 M-S Swiss Inn Radamis II is a 5* cruise, which offers its guests the unforgettable experience of cruising on the River Nile and visiting the best places in Egypt. The cruise has a variety of amenities such as swimming pool, bar, restaurant, sun deck, lounge and disco. Guests can relax in the beautifully decorated cabins of the Cruise which are fully equipped. Swiss Inn Nile Cruiser Radamis II sails between Luxor and Aswan or vice versa, a distance of 220 kilometers. With an overnight stay in Esna'Edfu and either Luxor or Aswan. Steep yourself in 7000 years of history while enjoying 21st century comfort and timeless Swiss hospitality cruising on the world's longest river, the Nile flows through a wealth of heritage in Upper Egypt. MONDAY Depart from the UK for your flight to Luxor. On arrival, you will be met and transferred to your chosen Nile cruise boat for an evening check-in. Overnight in Luxor. TUESDAY In the morning, visit the Luxor Museum. In the afternoon, visit the Temples of Karnak and Luxor on the East Bank. Overnight in Luxor. WEDNESDAY In the morning, visit the highlights of the West Bank, including the Valley of the Kings, the Temple of Queen Hatshepsut and the Colossi of Memnon. In the afternoon, sail via Esna Lock* to Edfu. Overnight in Edfu. THURSDAY In the morning visit the Temple of Horus in Edfu, before continuing along the Nile, mid-morning, to Kom Ombo. In the afternoon, visit the Temple of Sobek and Haroeris in Kom Ombo, and then continue on to Aswan. Overnight in Aswan. FRIDAY After breakfast, spend the day exploring the sights of Aswan, with a visit to the High Dam and the Temple of Philae in the morning, and a relaxing trip on a felucca past the Agha Khan Mausoleum and Elephantine Island in the afternoon. Overnight in Aswan. SATURDAY Spend the morning at leisure in Aswan, with the option of a trip to Abu Simbel. In the afternoon, sail from Aswan to Edfu. Overnight in Edfu. SUNDAY In the morning, sail from Edfu to Esna. Visit the Temple of Khnum at Esna before crossing the lock* and continuing on to Luxor in the afternoon. Overnight in Luxor. MONDAY After breakfast, disembark your cruise boat and transfer to Luxor airport for your return flight to the UK.